#stampinup #faithfulinkspirations So, I'm just a day late for Mother's Day--and I got my card in the mail late, too. But it's the thought that counts, right? My darling husband sent his mother some yummy chocolate dipped strawberries that arrived in time for Mother's Day. But the card, well, I just didn't have a lot of mojo last week, so I waited until the last moment to make it and get it in the mail. My hubby and I spent a whirlwind few days a couple of weeks ago. We drove two days to Arkansas to pick up our twins from their first year of college. We spent the 24 hours we were in Arkansas cleaning their rooms, packing their stuff, making a bajillion trips to the storage unit, getting a tire patched since we ran over a screw somewhere, and having a couple of family meals. Then we drove home for two days. It was exhausting. And when I got home, I was still super exhausted (or lazy) for the following week. I didn't even open the door to my stamping room--until I realized that I needed to get a card made and in the mail for my mother-in-law. Yikes! But I had one in mind and I pulled it together pretty quickly. It uses some continuing products and some retiring products. What do you think? My mother-in-law loves purple, so I thought I'd use some Elegant Eggplant Ink and Card Stock for a last time before it retires. 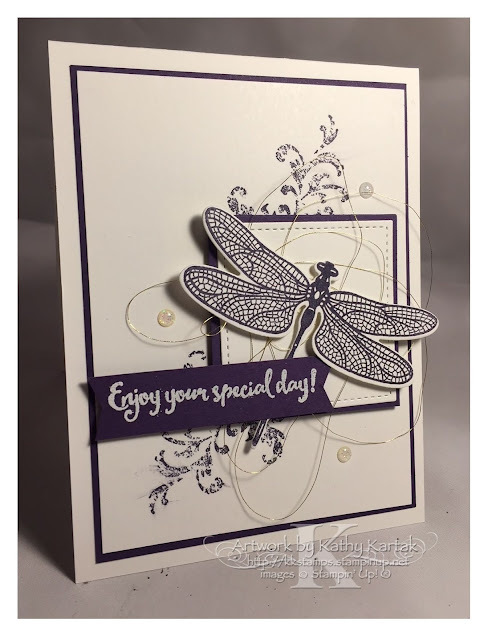 I stamped the dragonfly from the "Dragonfly Dreams" stamp set in Elegant Eggplant Ink onto Whisper White Card Stock and cut it out with the coordinating Detailed Dragonfly Framelit. I tousled some Gold Thread and adhered it to the back of the dragonfly before using Stampin' Dimensionals to adhere the dragonfly to a Whisper White square cut with one of the Stitched Shapes Framelits. I adhered that to an Elegant Eggplant square cut with one of the Layering Squares Framelits. I stamped a flourish from the continuing "Timeless Textures" stamp set in Elegant Eggplant, twice, onto a 3-3/4" by 5" Whisper White panel and adhered it to a 3-7/8" by 5-1/8" Elegant Eggplant panel. Then I adhered this to a Thick Whisper White Card Stock card base. I adhered the dragonfly element to the card with Stampin' Dimensionals. Next, I stamped a sentiment from the "Dragonfly Dreams" set in Versamark onto a 1/2" strip of Elegant Eggplant Card Stock. 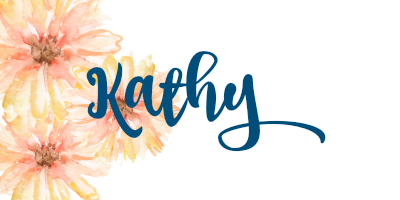 I sprinkled on some White Stampin' Emboss Powder and set it with my Heat Tool. I flagged the ends with my Paper Snips and then added this to the card with Stampin' Dimensionals. For a finishing touch, I added some Glitter Enamel Dots. REMINDER: Retiring stamp sets will only be guaranteed to be available until May 25. All other products are NOT guaranteed and are only available while supplies last. ALL retiring items will be discontinued after May 31.